(Newser) – Though rattlesnakes once occupied much of the US, humans have shrunk their populations—and now an insidious fungal disease is doing further damage. Ophidiomyces ophiodiicola surfaced here roughly 10 years ago, and it has since been found in nine eastern states, reports the AP. 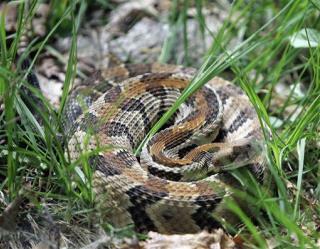 The eastern massasauga rattlesnake in Illinois is under attack, New Hampshire's rattlesnakes have suffered a population loss of 50%, and Vermont's venomous timber rattlers are down to two nesting sites. "I think potentially this could overwhelm any conservation effort we could employ to try to protect this last remaining population," says Vermont Department of Fish and Wildlife biologist Doug Blodgett. "We don't have any control over it." Most states require no license to hunt them, no limits on how many, and any method of take is legal. Consequently, they are beginning to evolve with no rattles ( which are usually the cause of them being found). Well they aren't as pretty as lions so I doubt many people will care. The fungus likely fell out in clumps from Yeti's old lady's bikini.